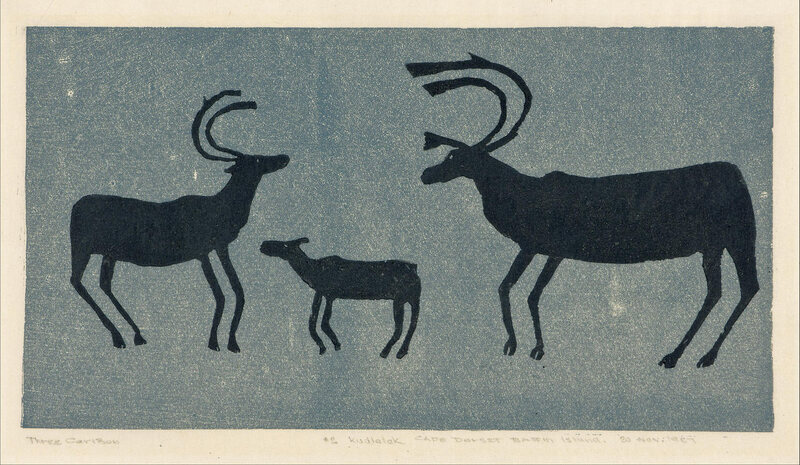 "Inuit Prints, Japanese Inspiration: Early Printmaking in the Canadian Arctic"
Niviasi [Niviaksiak], Three Caribou (1957), stonecut, 23 x 36.5 cm. Printed by Kananginak Pootoogook, Cape Dorset, Canada. 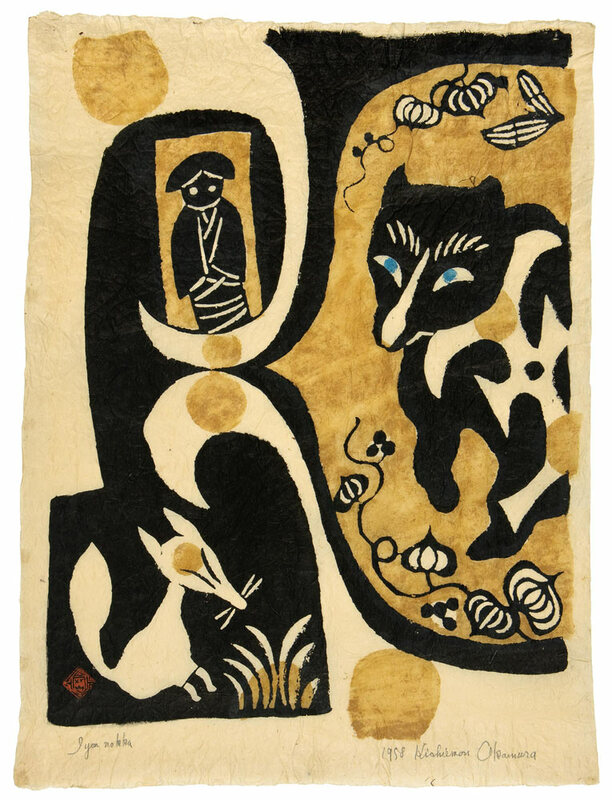 Osuitok Ipeelee, Owl, Fox and Hare Legend (1959), stencil, 56.9 x 45.7 cm. Printed by the artist,with James Houston, Cape Dorset, Canada. Houston had arrived in Cape Dorset in 1956 after working with Inuit communities across the Canadian Arctic for close to a decade. He was employed by the federal government as the Area Administrator for the South Baffin Island region, and his goal was to generate an infrastructure for Inuit art. The West Baffin Eskimo Co-Operative was born out of Houston’s desire to teach and foster a sustainable artistic trade with a definitive shift towards a graphic Inuit art. Prior to his establishment of the single room co-operative in Cape Dorset, Inuit art production was largely confined to sculpture and handicraft. There were some “skin pictures”—seal and caribou skin with appliquéd images of Inuit motifs such as wildlife, but nothing was produced on a scale large enough to be marketable. 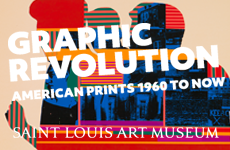 The first section of prints in the exhibition, “A Leap into the Unknown: 1957- 1958,” shows Inuit work from the Co-operative’s first year, when the shop was largely considered a craft space for small-scale art production such as printed cards and wrapping paper. Three Caribou (1957), a stonecut by Niviasi printed by Kananginak Pootoogook, was one of the first prints created in the Cape Dorset space. Arctic wildlife was, not surprisingly, a popular theme in these initial experiments, as were igloos and spear-hunters—familiar motifs from Inuit carvings. In November 1958, Houston went to Japan. Although he had studied at the Ontario College of Art (1938-1940) and the Académie de la Grande Chaumière, Paris (1947–1948), in light of this exhibition, his most transformative artistic training appears to have come from his three months in Japan, where he studied with Un’ichi Hiratsuka, a prominent member of the 20th century sōsaku hanga (creative prints) movement. Sōsaku hanga artists were noted for their expressiveness and for the elimination of outside labor—in contrast to tradition Japanese printmaking arrangements, they cut their own woodblocks and printed their own prints. 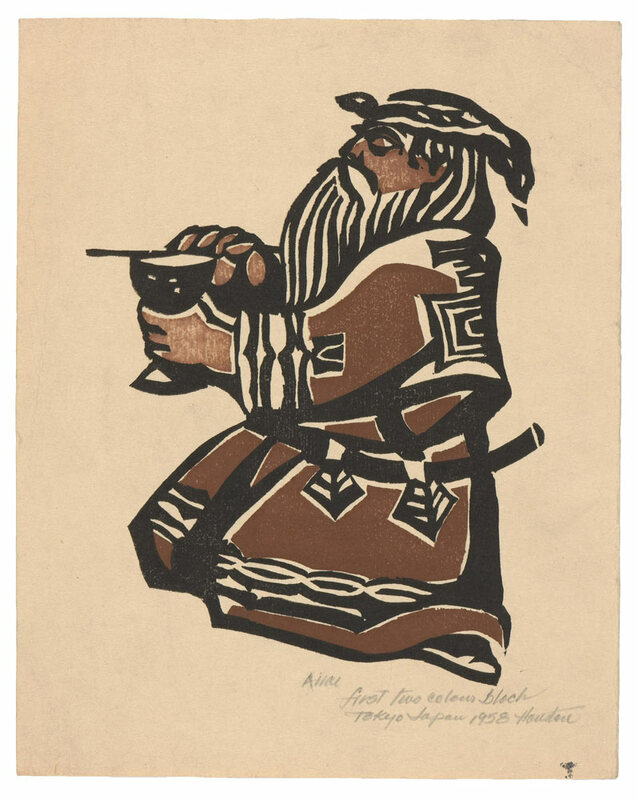 In the second section of the exhibition, “Lessons with a Japanese Master: 1958-1959,” the influence of Houston’s time with Hiratsuka can be seen in the Canadian’s woodcut Kneeling Ainu Priest (1958). Annotated as his first two-color block, the print is a portrait in bold lines, powerfully distinct from his lyrical ink and watercolor of an Ainu priest also on display. Houston’s months in Japan were not limited to learning printmaking techniques. He met with artists such as Shikō Munakata, Sadao Watanabe, and Yoshitoshi Mori and other key members associated with the popular and commercially successful mingei (folk craft) movement founded by Yanagi Sōetsu. 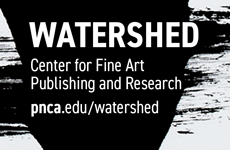 Houston saw how “traditional” art could be marketed in the context of modernism, and perceived a natural symbiosis between the abstracted forms and figures of Inuit art and the properties of Japanese printmaking. This connection is visible in the third part of the exhibition, “Japanese Inspiration: 1959-1963,” which includes prints made by Houston and Japanese printmakers hung alongside those of Inuit artists of the Cape Dorset area. While this tight presentation captures the energy of transnational exchange, it also highlights some significant differences. 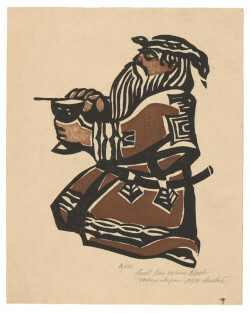 James Houston, Kneeling Ainu Priest (1958), woodcut, 25 x 20 cm. Printed by the artist, Tokyo, Japan. Houston returned to Cape Dorset at the end of January 1959 with Japanese tools, washi (handmade paper) and prints from artists associated with the sōsaku hanga movement including Hiratsuka and Kichemon Okamura. From the start, the techniques Houston brought back with him were reconfigured by Inuit artists to accommodate local resources. In the beginning of the Co-operative’s development, simple stencils were cut from sealskin and superfluous X-ray-film. The Canadian Arctic lies entirely above the tree line, so woodblocks were impractical, while stone, tusks, and antlers were easily accessible The imported Japanese tools had to be adapted to the carving of stone; sealskin replaced bamboo leaves for the baren (rubbing pad), brushes held polar bear fur instead of horsehair and handles were made of caribou antlers instead of wood. 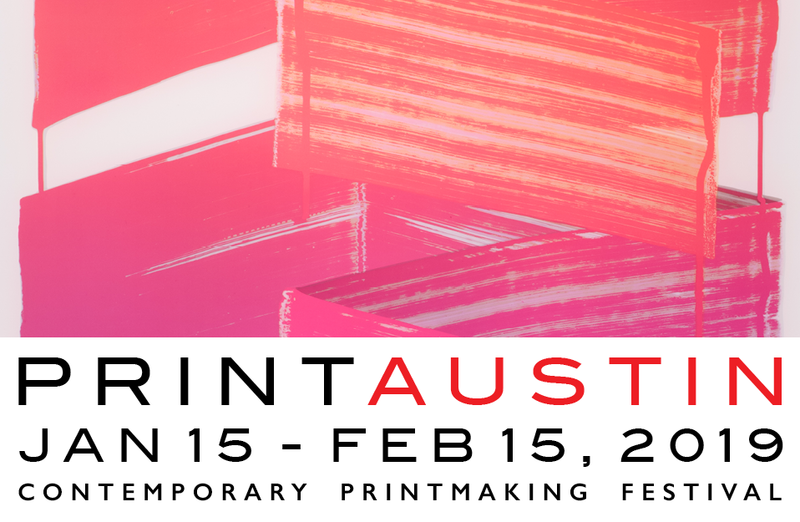 The small space of the studio also necessitated a more collaborative environment with both men and women contributing at all levels of the printmaking process, counter to the sōsaku hanga artists approach. 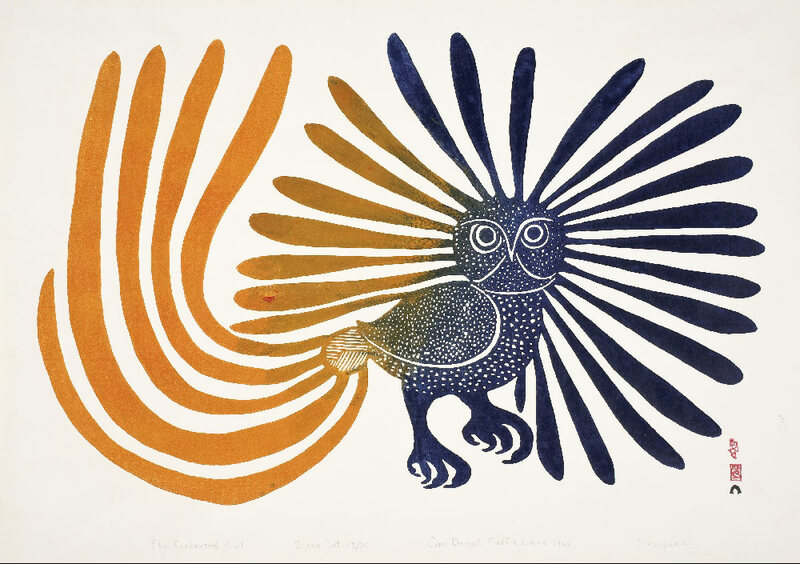 For example, the now iconic Enchanted Owl (1960) was drawn by Kenojuak Ashevak, but the stone was cut by Iyola Kingwatsiak and was printed by Eegyvudluk Pootoogook. Furthermore, Japanese woodblock prints utilized multiple blocks to achieve color printing, while Inuit stonecuts were produced by multiple colors applied to a single stone block. When a small select trial of thirteen prints from the burgeoning Cape Dorset workshop, chosen by Houston, sold out at a Hudson’s Bay Department Store in Winnipeg in December 1958, the departments of Northern Affairs and National Resources decided to distribute future prints through art galleries rather than department stores. Taking care not to saturate the market, they organized strategic annual releases beginning in February 1960, a practice that continues to this day with fall, spring and special release collections distributed to galleries in Canada, the United States and Europe. Kichemon Okamura, Iyon Nokka (1958), kappazuri stencil, 58.7 x 44 cm. Printed by the artist, Japan. The exhibition clearly illustrates the workings of this trans-Pacific influence, but closer inspection yields a deeper appreciation for Inuit experimentation and innovation from color to composition. 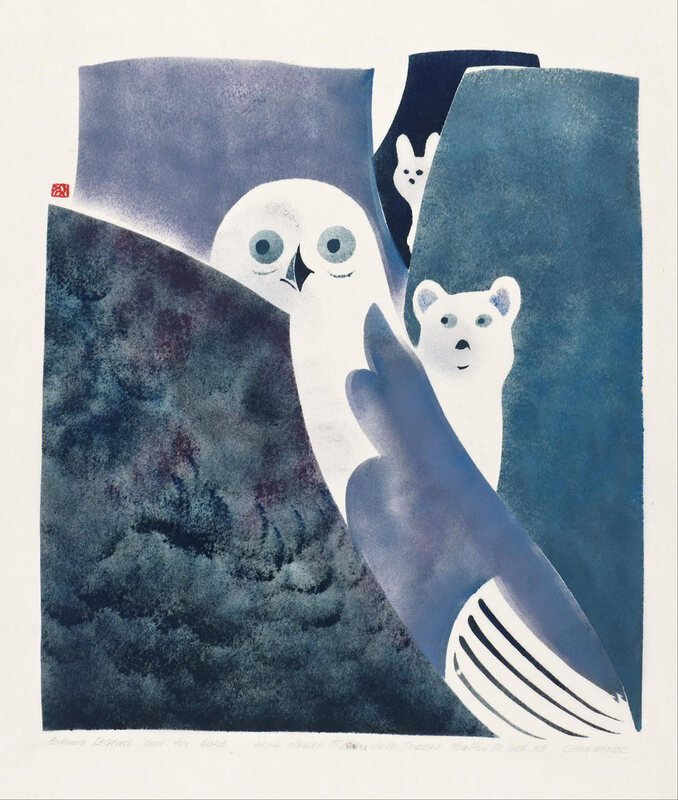 Owl, Fox and Hare Legend (1959) by Osuitok Ipeelee, which was printed by the artist at Cape Dorset along with James Houston, invites association with the nearby kappazuri (stencil prints) of Kichiemon Okamura. Yet the treatment of negative space and the use of brushwork to imbue the animal subjects with a playful and inquisitive tone is quite different. Okamura’s thick, bold outlines yield a nearly flat, storybook-like composition, while Ipeelee’s cast of characters peep out from varying depths of soft blocks of color. Monochrome prints or sumizuri were also prevalent, representing close to a quarter of the Cape Dorset studio’s 1959 collection. Houston himself left Cape Dorset for New York in 1962 after his relationship with his wife ended, and went on to produce award winning children’s books including Tikta’liktak: An Eskimo Legend. Though the exhibition is limited to the late 50s and early 60s, it is worth noting the ongoing legacy of those years: the 2012 Spring Collection included prints by Eleeshushe Parr, Kananginak Pootoogook, Kenojuak Ashevak and Kiakshuk in editions of forty-five or fifty with prices starting at $1000 and up to $1600 CDN. Even Houston could not have predicted the success of the single room craft house and the reputation Inuit artists working in Cape Dorset would build. 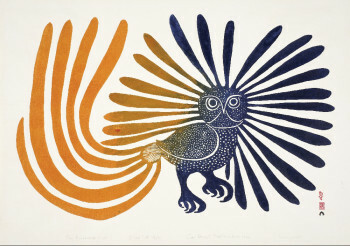 Kenojuak Ashevak, The Enchanted Owl (1960), stonecut, 30.4 x 60.8 cm. Stonecut by Iyola Kingwatsiak, printed by Eegyvudluk Pootoogook, Cape Dorset, Canada. The cultural and economic bond between Cape Dorset and Japan also continues today with washi. Included in the exhibition is the documentary, Threads That Connect Us: Washi-Makers Meet Cape Dorset Artists (2003/2010) by Michael Kahn. Kahn’s subject, the Osaki family and their handmade paper business, have been supplying washi through a Canadian distributor to the Cape Dorset region for more than half a century. The documentary follows the family as they make their way to the Canadian Arctic to meet with Inuit communities and demonstrate the process of making paper. While the act of faceto- face cultural interaction comes off as a little heavy-handed at times, the film keeps the exhibition’s theme fresh for a contemporary audience contemplating the global and local networks of material and artistic exchange while also alluding to the outside roles of cultural brokers. Wisely, both the exhibition and film leave room for debate on this point, choosing to celebrate the Inuit artists and the Cape Dorset print studio instead. The show closed recently at the Winnipeg Art Gallery in Winnipeg, Canada.